The clams that I bought in the market were already cleaned but I still rinse them for three times and submerge clams in cold water for about an hour until they are free of sand. 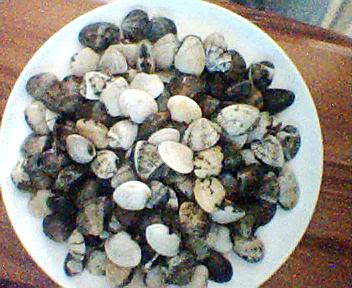 Adding 1/2 tsp of rock salt to the water will remove the sand from the clams, however, I prefer not to do it. Drain clams before cooking. Heat oil in a big pan or wok, saute onion, ginger, garlic until soft. Add clams, stir well before covering the pan for about 30 seconds. Open the lid and stir clams for a minute or so until clam shells have opened up. Add ground pepper, chilli powder and green onions.